Did your scheduled post not get published on time? Is it making you insane that no matter what you do scheduled post feature in WordPress is not working for you? This has been an ongoing issue with WordPress which doesn’t seem to get resolved with every new release. Some say it is because of the caching plug-ins. And few others say that it is your web host server issue and has nothing to do with WordPress. Ultimately, it is you and me, the users, who are getting affected with this issue. Irrespective of who need to solve this, it is an issue that ultimately gets blamed on WordPress. So the developers at WordPress need to make sure it gets resolved. Anyway, till that gets resolved, I have found a definitive solution for WordPress missed schedule issue. It just works. And no, it is not because of W3 Total Cache plugin. Why do you get “missed schedule posts” in WordPress? The only reason the posts don’t get published on the scheduled time is because of some misconfiguration the CRON function is not working properly. Essentially WP-cron need to kick in at the right time for the scheduling feature to work. I don’t want to get too technical here, but it is something that can be easily fixed. Don’t mess up with your WordPress function and config files. Don’t mess up with your W3 Total Cache or any other caching plugin settings. They are very important for your site, so don’t disable them. Don’t need to install another plug-in to solve this issue. Login to your Web Host account. In my case it is Bluehost, so I will show you the screens from there. But your web host will have something similar. Click on “Cron Jobs” icononyourcPanel. 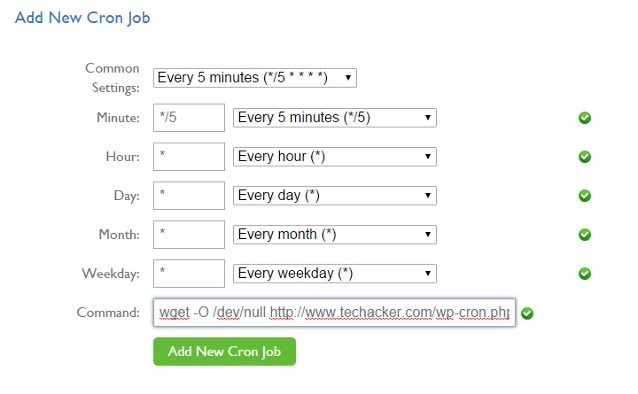 Once you are on cron jobs page, under Common settings, select “Every 5 Minutes (*/5 * * * *)” from the drop down. If you don’t post very often, you should increase this to once every hour or even once a day to reduce load on your server. Add the following command in the “Command” window. Now click on “Add New Cron Job” button at the bottom. As soon as this cron job is added, you can try scheduling a test post and see if that works. Chances are that it will work. That’s it. You just needed to add this command. This cron job is the solution for WordPress missed schedule issue. Ideally, we would want that to happen automatically in WordPress. But for now, adding it manually does the trick. Hope the trick helped you. I am relieved that it is working for me on Techacker. It is a major time saver. Do your scheduled posts gets posted on time? Were you using some plugin earlier to fix this issue? Let us know in comments section. If this article helped you eliminate this issue, please help share the love.